Skating for a cause since 1959, The Detroit Red Wing Alumni consists of former Detroit Red Wings and NHL/Professional players to benefit the community. From regular, yet informal gatherings over a glass of beer and a sandwich, it grew to be the most active and largest alumni organization in the National Hockey League. This is the Detroit Red Wings Alumni Association. Butcher's Inn, located in Detroit's colorful Eastern Market, was a favorite haunt of the former hockey stars. It was there that they would meet, eat, drink and talk - always lots of talk. One of the topics of discussion became forming an officially sanctioned alumni organization, highlighted by regular charity functions and, of course, hockey games. Today, after many sandwiches, charity games and millions of dollars raised for local charities and minor league hockey, the official Detroit Red Wings Alumni Association is among the most respected non-profit alumni organizations in North America. 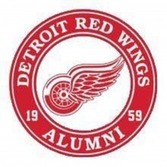 In fact, several new, as well as old, alumni groups have modeled their organizations after the Red Wings Alumni Association. This is partly due to the group's unparalleled success as benefactors to numerous charities and minor hockey programs. Great success often comes out of humble beginnings. This was the case for the Red Wings Alumni. Tommy Emmett, a then active member of the Detroit Lions Alumni Association, suggested to Larry Cain and several former Red Wing players that with a growing number of Red Wings Alumni taking up residence in the Southeast Michigan area, they should form an association. As the long time Red Wings Alumni treasurer Larry Cain recalls, “Tommy Emmett operated a business in the Eastern Market area, a block away from our meat plant. Therefore, we saw each other quite often. I was in regular contact with Red Wing legend Larry Aurie, who agreed that it was a great idea.” Unfortunately, Larry Aurie died very suddenly and didn’t live to see his advice acted upon. The idea, however, continued to live. “We decided to have an initial meeting on November 1, 1959 in the private dining area at Butcher’s Inn. Several former Red Wing players used to drop in for lunch or refreshments at Butcher’s and we continued to talk up the idea.” In attendance at that first meeting were Stu Evans, Ebbie Goodfellow, Jack Stewart, John Sherf, Normie Smith, Sid Abel, Ernie Burton, Rollie Roulston, Donnie Hughes, Jimmy Peters, Jack Tompkins, Larry Cain, and Tommy Emmett. The rest, as they say, is history. No other nominations were forthcoming so the slate was unanimously elected. At this point, the newly elected president took over the chair. Sid Abel reported that Bruce Norris and Jack Adams, as well as other members of the Red Wing organization, were solidly in favor of the creation of a Red Wings Alumni Club. Sid was asked to extend a special invitation to Norris and Adams to join the new organization. The new president, Stu Evans, appointed a Bylaws Committee to draft a set of bylaws for the organization. Members of this committee were Tommy Emmett (Chairman), Stewart Evans, Ebbie Goodfellow, Donnie Hughes, Normie Smith, Jack Tompkins and John Sherf. The official date of incorporation for the Red Wings Alumni Association was April 21, 1960, to operate for a term of 30 years, ending April 21, 1990. The group applied for an extension just prior to April 21, 1990, and the organization was set up on a "perpetual basis". The purpose of the Red Wings Alumni Association has changed over the years. Today, as in the past, the Red Wings Alumni Association meets monthly for fellowship and to outline plans for future charitable events. The Alumni Association raises money by playing some 25 charity games each season throughout Michigan and Ontario. The team is made up of former Red Wing and National Hockey League players, along with a few ex-college stars. The main philosophy of the organization has not changed over the years; have fun and enjoy fellowship as a group, while raising money for charitable organizations and people in need of financial assistance. Each year, the Red Wings Alumni donates in excess of $40,000 to various charities in Michigan and Ontario. These donations are above and beyond any money raised directly through the charitable events which can reach as high as $100,000 plus in any given year. All of these player contributions are put into perspective by the fact that they did not earn millions of dollars during their playing career. Each player also has responsibilities off the ice that keep them busy on a full-time basis. The easy thing for them to do would be to say they are too busy or too tired to play in a charity game. However, that's not the case. Many of these men perform harder than their doctors would like to see. But they do it for the game they love, the game that has been good to them and for the less fortunate in the community. Why is the Red Wings Alumni more successful than most other NHL alumni organizations? The most obvious answer is time. As one of the Original Six NHL teams, the Detroit Red Wings have a long and storied history. Some of the organizations original members date back to the 1940's and 50's, including Black Jack Stewart, Jimmy Peters, Sid Abel, Gordie Howe and Normie Smith. When you look down the roster today you see great names spanning the history of hockey, including Alex Delvecchio, Ted Lindsay, Dino Ciccarelli, Joe Kocur, Dennis Hextall, Nick Libett, Eddie Mio, Shawn Burr, Kevin Miller, Kris Draper and John Ogrodnick. The fans also get to see the stars of other NHL teams that live in or are from the Southeast Michigan and Southern Ontario area. Players such as Wayne Presley (Chicago Blackhawks), Craig Wolanin (Quebec Nordiques), Bryan Smolinski (Boston Bruins), Pat Peake and Paul MacKinnon (Washington Capitals), Tom Williams and Rob Palmer (LA Kings) and many more. The Red Wings Alumni provide their own referees to call a fair game. Jimmy Peters Sr. played for the Red Wings, Boston Bruins, Montreal Canadiens and Chicago Blackhawks during the 1940's and 50's and, until a few years ago, Peters played in the Alumni games. He has since become a referee who is ably assisted by Joe Klukay, a former Toronto Maple Leaf and four-time Stanley Cup Champion. The Alumni team plays an enjoyable game, mixing in some chicanery just for fun. And most important of all, the players take no compensation for their time, unlike other NHL alumni associations that pay their members. For all of the reasons outlined above, the Red Wings Alumni Association is one of the most respected Alumni Associations of any major sports franchise. As two-time president Gary Bergman once said, "We enjoy each other's company, we raise money for a lot of nice people and we have fun doing it."